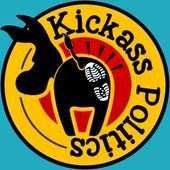 The KickAss Politics Podcast, as you might surmise from its title, is devoted mostly to politics. But podcaster Ben Mathis is also adept at exploring intriguing questions that arise in the tech world. In one recent podcast, Mathis posed the question "Can the FDA regulate and tax your smartphone apps?" Did that get your attention? I thought so. In other podcasts he highlights nine new mobile health and fitness apps and "15 Sharing Economy Apps That Will Change Your Life." You can download an episode or subscribe for free in the Apple iTunes Store.